Step 1 - What happens when food aromas reach our nose? "The big picture"
Popular information: An elegantly illustrated information "cartoon" at the Nobel prize site. Axel and Buck received the prize "for their discoveries of odorant receptors and the organization of the olfactory system". Basically this means: what actually happens when "smelly molecules" from the food reach your nose? The molecules obviously have to be in the gas phase, they have to evaporate. That's the reason why salt and sugar don't smell, and also that's why hot food smells stronger than cold food. When the odorant molecules reach your nose they "dock" onto so-called receptors, but this only happens if the molecule fits snugly into the "docking station", the receptor. In our nose we have around 1000 different receptors with different shape that can accept different sorts of molecules. how come that we can smell more than 10 000 different odours when we only have around 1000 different receptors? What happens when the molecules "dock" onto the receptors and the signals are forwarded to the brain? How come that humans, mice and dogs have so different thresholds to smelling things? The answers can be found nicely illustrated in the above mentioned popular information. These results also have bearing on the sense of taste since both taste and odour molecules are sensed through so-called G-protein coupled receptors. Step 2 - What happens when tasting or odorant molecules reach our taste or smell receptors? Robert J. Lefkowitz and Brian K. Kobilka - The Nobel Prize in Chemistry 2012 "for studies of G-protein-coupled receptors"
Popular information: An illustrated popular article at the Nobel prize site. substances and forwarding the signal to the inside of the cell. Lefkowitz and Kobilka received their joint prize "for studies of G-protein-coupled receptors". They discovered that these G-protein coupled receptors are a very general type of receptors that are responsible for a lot of processes which are controlled by chemical substances. Examples are how various organs react when hormones are released, such as why our heart races, our breathing rate increases and digestion is given less priority when adrenalin is released if we get scared. However, this type of receptor is also responsible for receiving chemical substances when we smell and taste. You might say that Lefkowitz and Kobilka revealed detailed information about one step in the process described by Axel and Buck, namely what exactly happens when molecules dock onto our taste buds on the tongue or odour receptors in the nose. Step 3 - What happens when the signal has been received by the receptor? Alfred G. Gilman and Martin Rodbell - The Nobel Prize in Physiology or Medicine 1994 "for their discovery of G-proteins and the role of these proteins in signal transduction in cells"
Popular information: An illustrated information "cartoon" at the Nobel prize site. Gilman and Rodbell received their prize ten years earlier than Axel and Buck. Their discoveries must have been vital for both later prizes. Particularly Lefkowitz and Kobilka's work (step 2 above) builds directly on this work. Whereas Lefkowitz and Kobilka got their prize in 2012 for work on the receptors (see picture above), Gilman and Rodbell got their prize 18 years earlier for what happens when the signal is being transmitted further by the receptor. Inside the cell, close to the inside-part of the receptor, there are so-called G-proteins. When the receptor is activated (e.g. by an odorant molecule) it puts the G-protein into work which in turn does its job in transmitting the signal further. This "job" can be G-proteins in the brain registering light (responsible for you being able to see), forwarding signals from your tongue or nose to the brain and so forth. This research describes thus one part of the previous step, so you may say that this work is in a way at an even more detailed level than the two above. Cross section of cell membrane, outside up and inside down. Chemical substance (e.g. 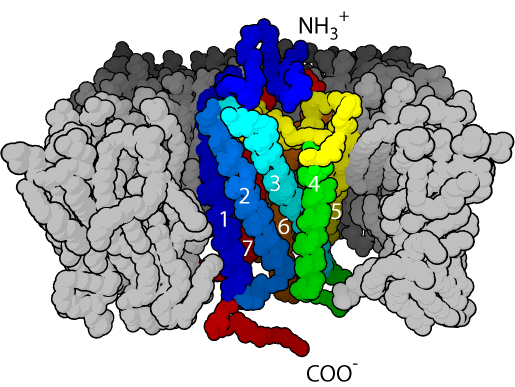 odour or taste molecule) docks to the receptor (blue rods). The receptor affects the G-protein inside the cell (pink dot cluster), carrying out its function. In my eyes, these three prizes reveal how wonderfully complex biological systems are (this is just a very few processes of our biology). At the same time they demonstrate the immense achievements of ingenious researchers, as result of loads of hard work, persistence and elegant solutions in solving these puzzles. Finally they demonstrate how science is built brick by brick; the results we get today or tomorrow all build upon the work of others. garidozo: You're right, it's been a stand still for a long while. I'm still discussing with myself where to proceed with this. At the moment we're trying to push on with the Kitchen stories project/network (relevant blog entries here). We've set up a Facebook group on this as well (search for "kitchenstoriesnetwork" on FB if you're in there). Thanks for the nudge, though. Perhaps this is what it takes to get on with the blog?